Neuroscientist Sandra Aamodt’s TED Talk “Why dieting usually doesn’t work” has been viewed over 4 million times. 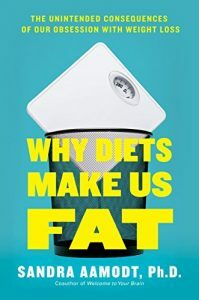 She really didn’t want to do a TED Talk, but she was so driven to put a science-based, anti-diet book out into the world that she marched her introverted self onto the TED stage, stood on the big red dot, said what we needed to hear, and eventually landed her book “Why Diets Make Us Fat: The Unintended Consequences of Our Obsession with Weight Loss”. 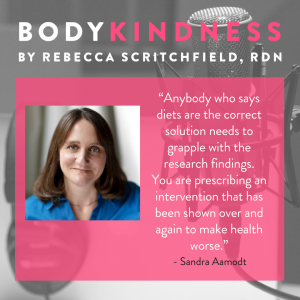 Tune in and listen to Sandra and I discuss why dieting and the brain are NOT friends and why dieting will never support a human’s healthy brain function. Sandra explains how and why body weight is regulated by the brain (thank goodness!) and that may mean (gasp) that fat people will be fat no matter what they do! And people who diet are likely to end up regaining the weight they lost (and then some). We get into genetic factors that impact our weight and have a laugh at the idea of canceling our “memberships” to the BS-measurement, otherwise known as the BMI. You’ll hear us talk about stress, the pros and cons of cortisol, the value of sleep, and why mindful eating is such an essential part of self-care. By the time you’re done listening to this show, you will either feel super pumped about your commitment to never diet again — OR you’ll realize that dieting is a losing game, you’ll probably get angry, (I did!) and then you’ll get to work at creating your better life with Body Kindness. You can’t “willpower” your way to lasting weight loss. Sandra is the author of Why Diets Make Us Fat: The Unintended Consequences of Our Obsession with Weight Loss (2016). She also coauthored two popular neuroscience books with Sam Wang. Welcome to Your Brain (2008) was named Young Adult Science Book of the Year by the American Association for the Advancement of Science and has been translated into twenty languages. Welcome to Your Child&#39;s Brain (2011) was published in twelve languages. She received a degree in biophysics from Johns Hopkins University and a doctorate in neuroscience from the University of Rochester. After four years of research at Yale University, she joined Nature Neuroscience, a leading scientific journal in the field of brain research, at its founding in 1998 and was editor in chief from 2003-2008. She lives in Northern California.